• Spring/Summer 2014 and Fall 2014 HIGP Seminar Series — view the schedules. 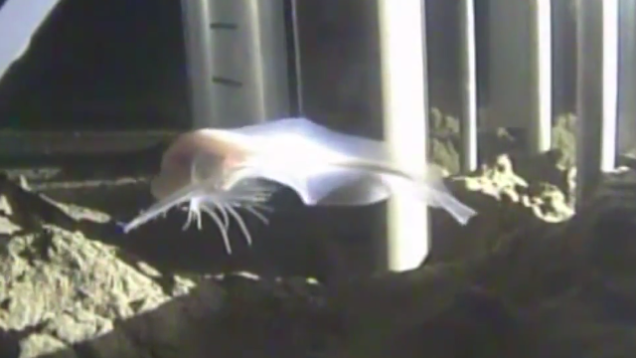 A ghostly never-before-seen fish with wing-like fins has set a new depth record for fish. During a recent 30-day expedition aboard the Schmidt Ocean Institute (SOI)’s research vessel Falkor to the Mariana Trench in the Pacific Ocean—the deepest place on Earth—the previously-unknown snailfish was filmed several times floating along the dark sea floor, reaching a record low of 8143 meters below the surface. The unusual fish, spotted on the expedition led by Oceanography professor Jeff Drazen and HIGP professor Patty Fryer, has a different body shape from other known varieties of snailfish. It boasts broad, translucent fins, stringy appendages, and an eel-like tail that allows it to glide smoothly. Read more about it and watch the video at the Washington Post, KHON2, New Scientist, the Guardian, and io9; read more about it in the Honolulu Star-Advertiser (subscription required), UH Mānoa News, at BBC, and Hawaii News Now. Image courtesy of SOI/HADES; click on it to see the full version. HIGP Research Professor John Bradley is co-author on a paper "Cometary Dust in Antarctic Ice and Snow: Past and Present Chondritic Porous Micrometeorites Preserved on the Earth's Surface" appearing in the advance online issue of the January 15 volume of Earth and Planetary Science Letters. Researchers have discovered comet dust preserved in the ice and snow of Antarctica, the first time such particles have been found on Earth's surface. The discovery unlocks a promising new source of this material. The oldest astronomical particles available for study, comet dust can offer clues about how our Solar System formed. Until recently, the only way scientists could collect comet dust without going to space was by flying in the stratosphere using research planes equipped with specially-designed collectors. Read more about this research at news.sciencemag.org. Image courtesy of Takaaki Noguchi, Kyushu University. Milton Garces (HIGP Associate Researcher and Infrasound Laboratory ISLA Director) appeared on Bytemarks Café to talk about his development of an Infrasound mobile app and his group's selection as one of seven student and faculty research teams for the inaugural cohort of the XLR8UH Proof of Concept Center startup accelerator. The Center will harvest promising UH research, develop talented UH entrepreneurs, and connect them to a diverse network of investors and businesses in a program designed to help bring research and products out of the lab and on to the market. Listen to the broadcast on the Bytemarks archive page; read more about XLR8UH in the Pacific Business News and the UH news release. Image courtesy of Bytemarks Café. HIGP Director, Rhett Butler, discusses attaching scientific sensors to new ocean telecommunication cables on Hawaii News Now. Watch the video. One of the seminal works on astronautics and space flight has been published in English under the leadership of Trevor Sorensen, HSFL project manager and HIGP professor. Sorensen led the English-language translation of Hermann Oberth’s Die Rakete zu den Planetenräumen (The Rocket Into Planetary Space) for the American Astronautical Society History Committee, supported by a team of specialists that included HIGP professor Peter Englert. Oberth is considered by many to be the Father of Space Flight and his work eventually led to the Apollo Moon missions. For more information, please visit the SOEST Facebook posting. A news item in Kaunānā, the research publication of the Univeristy of Hawai'i at Mānoa, highlights work by UH scientists and a United Nations task force. The official report was developed by the Science and Society Committee of the International Telecommunication Union (ITU), the Intergovernmental Oceanographic Commission of the United Nations Educational, Scientific and Cultural Organization (UNESCO/IOC), and the World Meteorological Organization (WMO) Joint Task Force on Green Cables, under the leadership of Rhett Butler (HIGP Director). Access the report "The Scientific and Societal Case for the Integration of Enviornmental Sensors into New Submarine Telecommunication Cables" here: http://www.itu.int/dms_pub/itu-t/opb/tut/T-TUT-ICT-2014-03-PDF-E.pdf. The final phase of an Army-funded research effort began on October 21, 2014 to further investigate sea-disposed military munitions off the coast of O‘ahu. This research will take place south of Pearl Harbor at an area designated by the U.S. Department of Defense (DoD) as the Hawai‘i-05 (HI-05) site. It is a continuation of the Hawai’i Undersea Military Munitions Assessment (HUMMA), which used towed sidescan sonars, HURL submersibles, and remotely operated vehicles — including Woods Hole Oceanographic Institution (WHOI)’s Jason. “HUMMA has dramatically increased our understanding of what is happening at historical sea disposal sites,” stated HIGP researcher and principal investigator Margo Edwards. See our related March 2014 news item. Read more about it and watch the videos at KHON2 and KITV4 (autoplays); read more about in the Washington Post, the Honolulu Star-Advertiser (subscription required), UH System News, PhysOrg, ABC News, West Hawaii Today, and Ka Leo. Image courtesy of UHM/HUMMA. The American Geophysical Union has issued a press release, "Massive Debris Pile Reveals Risk of Huge Tsunamis in Hawai'i," highlighting the research of HIGP Director, Rhett Butler who is lead author on a new paper in the current issue of Geophysical Research Letters. Coauthors are David Burney (National Tropical Botanical Garden) and David Walsh (Pacific Tsunami Warning Center). Their paper gives supporting evidence that a 500-year-old tsunami deposit on Kaua'i is linked to a magnitude 9+ earthquake in the eastern Aleutians. The findings have prompted Hawai'i officials to revise tsunami evacuation maps (that had been based in part on the 1946 tsunami) to account for the possibility of an extreme tsunami event in the future. The updated maps are expected by the end of this year. Read more about the research, including comments by Geophysicist Gerard Fryer (Pacific Tsunami Warning Center and HIGP affiliate faculty), in EarthSky–How Often Might Hawaii Get a Monster Tsunami? and NBC News–Debris Mass in Huge Sinkhole Shows Hawaii's Tsunami Risk: Study. See also the UH News Release. (Left) Klaus Keil speaking at the award ceremony during the 92nd annual meeting of the German Mineralogical Society. (Right) Receiving the award from Prof. Francois Holtz (Society's Vice-President and President-elect). We extend our warmest congratulations to Klaus Keil, HIGP Emeritus Professor, who has been awarded the Abraham-Gottlob-Werner Medal, the highest honor for scientific research bestowed by the German Mineralogical Society. Given in recognition of outstanding scientific work, Dr. Keil is honored for his extensive research on the mineralogy and petrology of extraterrestrial materials. The medal was presented in September by Prof. Francois Holtz, the Society's Vice-President and President-elect (pictured on the right) during the 92nd annual meeting of the Society, held in Jena, Germany, which is also Dr. Keil's hometown. The award citation included, "Prof. Keil is one of the outstanding petrologists who pioneered petrological studies by combining these with high-resolution analytical techniques, and he is one of the most world-renowed cosmochemists. Prof. Keil and Kurt Fredriksson pioneered the application and development of electron beam micoanalysis for chemical studies of extraterrestrial samples." ThinkTech Hawaii features a trio of HIGP scientists today: Sarah Fagents, Anupam Misra, and Shiv Sharma. With the show's host Jay Fidell, they discuss their involvement with NASA Mars missions and planetary research on "Manoa Goes to Mars." Watch the show: The SOEST Hour on the ThinkTech Hawaii YouTube channel. Milton Garces, HIGP Associate Researcher and Director of the Infrasound Laboratory, explains his work in this article "Erratic Furnaces of Infrasound: Volcano Acoustics" in Sounding Out!, a weekly online publication of sound studies. Seven student and faculty research teams have been selected as the inaugural cohort of the XLR8UH Proof of Concept Center startup accelerator. The Center aims to harvest promising UH research, develop talented UH entrepreneurs, and connect them to a diverse network of investors and businesses in a program designed to help bring research and products out of the lab and on to the market. Among the startups selected are Infrasound with Milton Garces (HIGP Associate Researcher and Infrasound Laboratory ISLA Director). His team is developing an Infrasound mobile app to aid early detection and relief services after natural disasters. Another selection is Cosmos Company with Trevor Sorenson (HIGP Projessor and Project Manager of the Hawai'i Space Flight Laboratory) and Eric Pilger (HIGP Systems Engineer). Their team is designing open source software to support development and operations of spacecraft. Read more about XLR8UH in this UH News Release and in the Pacific Business News. HIGP Assistant Researcher Ryan Ogliore is co-author on a paper "Evidence for Interstellar Origin of Seven Dust Particles Collected by the Stardust Spacecraft" published in Science and 12 papers published in the September 2014 issue of Meteoritics & Planetary Science. The papers describe results from the Stardust Interstellar Preliminary Examination, including details of the first potential interstellar particles collected by NASA's Stardust spacecraft. The Science paper's lead author, Andrew Westphal (University of California at Berkeley), is joined by 65 scientists at other institutions, including the Univeristy of Hawaii, and 30,714 volunteers of the Stardust@home citizen science project. For more information please see the NASA press release, UC Berkeley press release, and Stardust@home. This month the University of Hawai'i and HIGP celebrates Vi Nakahara's 40-year anniversary of service. With great appreciation we say congratulations and mahalo. See the UH News–list of August 2014 anniversaries. The Honolulu Star-Advertiser celebrated Sunday night's supermoon (full Moon at perigee) with an article featuring HIGP/G&G/UH NASA Astrobiology Institute graduate student Katie Robinson and her studies of Apollo samples. Katie's analyses of lunar apatite grains are leading to a better understanding of the chemically-bound water in the lunar interior—revealing more about how water originated and was redistributed in the Moon. Read more: Moon Rocks: UH Scientists Search for Answers in Souvenirs from Apollo Missions written by Steven Mark and see the archived news item: Water in Moon Rocks Provides Clues and Quesitons. Image courtesy of Dennis Oda, Star-Advertiser. NASA announced today the selection of seven science instruments for the Mars 2020 rover chosen from a field of 58 proposals received from researchers and engineers worldwide. Among the selections are the Mastcam-Z, an advanced camera system, with team volcanologist HIGP's Sarah Fagents who will work with the team's principal investigator Jim Bell (School of Earth and Space Exploration, Arizona State University). Also selected is the SuperCam instrument, with Raman and fluorescence spectroscopy experts HIGP's Shiv Sharma and Anupam Misra who will work with the team's principal investigator Roger Wiens (Los Alamos National Laboratory). Congratulations! For more information, please see the NASA Announcement of Mars 2020 Rover Payload, UH news release, Mastcam-Z press release from ASU, and SuperCam press release from LANL. Also watch the KITV news report. HIGP Professor, Patricia Fryer, expedition geologist on James Cameron's DEEPSEA Challenge project (see 2012 news report), is heading to New York City to attend the premiere of the documentary "DEEPSEA Challenge 3D." Cameron completed the record-breaking Mariana Trench Dive on March 25, 2012 and in May, 2014 released the DEEPSEA Challenge 3D trailer for the movie, which has its world release date on August 8, 2014. Watch the trailer — watch for Fryer's cameo in a group shot at the 2:35 mark! Read more, with quotes from Fryer, at National Geographic, DEEPSEA Challenge—Geology. Sub photo courtesy of Mark Thiessen, National Geographic. HIGP Researcher and Director of the W. M. Keck Cosmochemistry Laboratory, Gary Huss, and HIGP Emeritus Professor, Klaus Keil are co-authors on a paper "A Fossil Winonaite-like Meteorite in Ordovician Limestone: A Piece of the Impactor that Broke Up the L-chondrite Parent Body?" appearing in the advance online issue of the August 15 volume of Earth and Planetary Science Letters. The paper's lead author is HIGP collaborator Birger Schmitz of Lund University, Sweden. Read more about the new kind of fossil meteorite in LiveScience. Image courtesy of Birger Schmitz. ThinkTech Hawaii features a trio of UH scientists today: Karen Meech (Institute for Astronomy and Principal Investigator of the UH NASA Astrobiology Institute), Mike Mottl (SOEST - Oceanography), and HIGP's Jeff Taylor. With the show's host Jay Fidell, they discuss astrobiology and what makes Hawai'i a unique place to answer some important questions about the role of water in the formation and evolution of habitable planetary systems with interdisciplinary science teams of faculty, post-doctoral fellows, and students. Watch the show: The SOEST Hour on the ThinkTech Hawaii YouTube channel. Elsevier publishers and the editors of Icarus have recognized HIGP Researcher Paul Lucey for his merit in peer review and have awarded him a certificate of reviewing excellence. Congratulations. HIGP Associate Specialist and Manager of the Asia-Pacific Data-Research Center, James Potemra, is co-author on a paper "The Indonesian Seas and Their Role in the Coupled Ocean-Climate System" appearing in the June 22 advance online publication of Nature Geoscience. The paper's lead author is Janet Sprintall of Scripps Institution of Oceanography at UC San Diego. For more, see the UH News Report New Understanding of Ocean Passageway Could Aid Climate Change Forecasts. With our congratulations, HIGP is pleased to announce G&G/HIGP graduate student Jonathan Sleeper has been awarded the 2014 Denise B. Evans Fellowship in Oceanographic Research. Currently a Ph.D. student, Sleeper obtained an M.S. degree in Marine Geophysics from the University of Hawaii Mānoa in 2011 with advisor Dr. Fernando Martinez. His current research, also with Martinez, focuses on the effects of both spreading rate and subduction-related chemical heterogeneities on the volcanic and tectonic characteristics of backarc spreading centers. For more information visit the Denise B. Evans Fellowships in Oceanographic Research website. Congratulations to HIGP/G&G/UH NASA Astrobiology Institute graduate student, Christine Jilly, who is co-recipient of the 2014 Outstanding Paper Award for Young Scientists, as one of five student authors on the manuscript titled "Identification and Characterization of Science-rich Landing Sites for Lunar Lander Missions using Integrated Remote Sensing Observations," which was published in Advances in Space Research. The award is bestowed biennially by the Committee on Space Research (COSPAR) of the International Council for Science. In addition to Jilly, the award-winning student authors are Jessica Flahaut (ENS, Université Lyon), Jean-Francois Blanchette-Guertin (University of British Columbia), Priyanka Sharma (University of Arizona), and Audrey Souchon (Université de Toulouse III); with additional faculty authors Wim van Westrenen (University Amsterdam) and David Kring (Lunar and Planetary Institute, Houston). The graduate students were summer interns at the Lunar and Planetary Institute node of the NASA Lunar Science Institute, now known as the Solar System Exploration Research Virtual Institute. For more, please see the Intern Program description at the Lunar and Planetary Institute. The Consortium for Materials Properties Research in Earth Sciences, also known as COMPRES, has announced that its selection of Distinguished Lecturers for the 2014–2015 Distinguished Lecture series in Mineral Physics are HIGP Associate Researcher Przemyslaw Dera and Lowell Miyaghi of the University of Utah. The lecture series, launched in 2008 and aimed at undergraduate student audiences, features topics that emphasize the exciting high-pressure geoscience research being conducted within the COMPRES community and its significance for understanding fundamental Earth and planetary processes. Przemek's lecture titles are "High-pressure Adventures with Metastability and Subduction" and "Tales of Rock and Sand: A Crystallographic Journey From Hades to Heaven." For details please visit the: COMPRESS Distinguished Lecture series. We are pleased to announce the approval by the Board of Regents of the 2014 tenure and promotion of HIGP's James Foster to Associate Researcher. Foster's work includes geodesy, GPS meteorology, and the impact and mitigation of the atmosphere on space geodetic measurements. Congratulations! HIGP/G&G graduate student, Laura Corley, has been awarded a NASA Earth and Space Science Fellowship for research on the effective contribution of temperature, space weathering, and volatiles on regolith reflectance. Laura is pursuing a Ph.D. studying space weathering of airless bodies (e.g., the Moon, Mercury, and asteroids) through experiments and remote sensing data with advisor, Jeffrey Gillis-Davis. Laura received her B.S. degree in Geology and Geophysics from the University of Hawaii at Mānoa. Congratulations! HIGP/G&G/UH NASA Astrobiology Institute graduate student, Christine Jilly, has been awarded a NASA Earth and Space Science Fellowship for research on timescales and conditions of aqueous alteration in CR chondrites. Christie is pursuing a Ph.D. in cosmochemistry with advisor, Gary Huss, in the UH W. M. Keck Cosmochemistry Laboratory. Christie received her B.S. degree in Astronomy from the University of Southern California. Congratulations! The SOEST 25th Anniversary Banquet, held on April 17, 2014, brought together a reunion of four HIGP Directors, pictured left to right: Drs. Rhett Butler (current Interim Director), Klaus Keil, Charles Helsley, and Peter Mouginis-Mark. Photo courtesy of Ada Mark. Funded by the National Nuclear Security Administration (NNSA) and led from the University of Michigan-Ann Arbor, a 13-university team will work with eight national laboratories under the newly established consortium called the Center for Verification Technology. Milton Garces, HIGP Associate Researcher and Director of the U.H. Infrasound Laboratory will lead the infrasound work, which will include graduate students and post-doctoral researchers. The consortium's overall mission covers research and development in nuclear arms control verification technologies, including nuclear safeguards effectiveness. In addition to the University of Michigan and University of Hawaii, the consortium includes: the Massachusetts Institute of Technology, Princeton, Columbia, North Carolina State, Pennsylvania State, Duke, University of Wisconsin, University of Florida, Oregon State, Yale, and the University of Illinois at Urbana Champaign; the Princeton Plasma Physics Laboratory; and several national laboratories, including Los Alamos, Lawrence Livermore, Sandia, Lawrence Berkeley, Oak Ridge, Pacific Northwest and Idaho. For more, see the Press Releases from NNSA and Michigan News, and news item in Pacific Business News. ATLAS: Asteroid Terrestrial-impact Last Alert System, organized by astronomers and engineers from the University of Hawai'i and the Space Telescope Science Institute, is a NASA-funded asteroid impact early warning system. HIGP/G&G graudate student, Myriam Telus, is featured in one of the ATLAS videos discussing meteorites; watch it here. Acknowledging the 50-year anniversary of the great Alaska earthquake of March 27, 1964, the local media has spotlighted current assessments of megaquakes, tsunamis, warning systems, and coastal evaucation plans affecting Hawaii. HIGP Interim Director Rhett Butler and HIGP affiliate faculty and senior geophysicist at NOAA's Pacific Tsunami Warning Center Gerard Fryer are among those quoted in the March 27, 2014 Honolulu Star-Advertiser article: "9.2 Earthquake Changed Thinking about Tsunamis" (subscription required). Image of Kodiak, Alaska courtesy of the U.S. Geological Survey. On March 29, an underwater remotely-operated vehicle (ROV) owned and operated by University of Hawaii–Mānoa School of Ocean Earth Science and Technology (SOEST) was used in the fifth phase of an Army-funded research effort to further investigate sea-disposed military munitions. This work took place at a deep-water site south of Pearl Harbor. Margo Edwards, HIGP Researcher and CIMES Director, is the Principal Investigator leading the expedition. In her news release in Kaunānā, Dr. Edwards said, "The Hawaii Undersea Military Munitions Assessment, or HUMMA, has dramatically increased our understanding of what is happening at historical sea disposal sites. We've been able to bound the areas affected, characterize the method of disposal to focus on specific types of munitions, and measure the infiltration of munitions constituents into the surrounding sediments at levels on the order of parts per million. We have also collected specimens living in direct contact with the munitions, but have not found evidence to suggest that the munitions constituents are affecting them. In contrast, our research shows that several types of animals use the munitions as habitats." U.H. is undertaking this research in partnership with the U.S. Army, Woods Hole Oceanographic Institution, and Environet, Inc., a local environmental consulting firm. Dr. Edwards further said, "We have been sharing the methods developed and results discovered by U.H. at international meetings in support of an open dialogue for a global problem." In that spirit, the expedition hosted observers from Australia and Europe. These international partnerships support a primary goal of UH's Hawaii Innovation Initiative (HI2) —broadly transitioning our research and knowledge to enhance global understanding. Read more about the project and watch video at KITV4, Hawaii News Now, and KHON2; read more about it in the Honolulu Star-Advertiser (subscription required), in Kaunānā, and in The Military Engineer. Image courtesy of HUMMA. HIGP's Sarah Sherman led a workshop "Living on a Heat Island?" for students at Sacred Hearts Academy's annual 2014 Science Symposium for Girls in Honolulu. The day's 21 hands-on workshops focused on science, technology, engineering, and mathematics and attracted more than 400 participants from 84 Oahu schools. The heat island workshop used handheld Infrared Thermometers and activities Sarah developed through HIGP's Rob Wright's remote sensing project: HawaiiView. HIGP/G&G graduate student Sarah Crites is lead author on a paper "Protron Flux and Radiation Dose from Galactic Cosmic Rays in the Lunar Regolith and Implications for Organic Synthesis at the Poles of the Moon and Mercury" published in Icarus. Additinal co-authors are her HIGP advisor Paul Lucey and David Lawrence (The Johns Hopkins University Applied Physics Laboratory). Their work involves modeling the proton flux from galactic cosmic rays at the lunar poles to test hypotheses of how organic compounds may be produced in polar microenvironments from in-situ inorganic material. Also see this highlight of their research in New Scientist, "Seeds of Life Can Sprout in Moon's Icy Pockets." Congratulations to Art Kimura and Rene Kimura upon being named Living Treasures of Hawaii. Among six recipients, the Kimuras were recognized as visionary educators and proponents of science. Bestowed by the Honpa Hongwanji Mission of Hawaii, the Living Treasure Award recognizes and honors individuals "who have demonstrated excellence and high standards of achievement in their particular fields of endeavor, and, through their continuous growth, learning and sharing, have made significant contributions towards enriching our society." Attending the 39th annual recognition ceremony and luncheon were the Kimura's sons and their families, Art's mother, Hawaii Governor Neil Abercrombie, and colleagues including HIGP's Luke Flynn (Director of the Hawaii Space Grant Consortium) and Marcia Rei Sistoso, HSGC Executive Director & Program Coordinator. In remarks to friends, Art and Rene shared, "We are so so humbled to stand in this circle of honorees, who have made amazing contributions to our society/community. With our deepest gratitude to you all." Read more in the Hawai'i Tribune Herald. HIGP welcomes new Assistant Researcher Dr. Bin Chen. Dr. Chen received his Ph.D. in Geology from University of Illinois at Urbana-Champaign in 2009. His principle research interest lies in understanding the physics and chemistry of Earth and planetary interiors through direct examination of material properties under high pressure-temperature conditions using a wide spectrum of techniques available in synchrotron and neutron facilities and in-house laboratories. His research takes a two-pronged approach: using the multianvil apparatus for sample syntheses and high pressure-temperature measurements on large volume samples and the diamond anvil cell for determination of elastic and acoustic properties, combining with laser, X-ray and microanalytical techniques. Recently Bin has endeavored to understand the deep carbon cycle in the Earth's interior with a focus on carbon in Earth's core. Milton Garces, HIGP Associate Researcher and Director of the U.H. Infrasound Laboratory, and HIGP field systems engineer and infrasound analyst Brian Williams discuss their infrasound work on Jay Fidell's ThinkTech Hawaii show. Watch and listen: The Airbursts of Infrasound on the ThinkTech Hawaii YouTube channel. The W. M. Keck Cosmochemistry Laboratory at HIGP has a new website: www.higp.hawaii.edu/cosmochemistry/. The description of the facility has been expanded to include advice on how to arrange instrument time and prepare samples for analysis. The Cameca ims 1280 ion microprobe and associated equipment are used to investigate the origin of the Solar System—read more about the research at the website or contact Laboratory Director Dr. Gary Huss or Laboratory Manager Dr. Kazuhide Nagashima. HIGP researchers John Bradley, Hope Ishii, and Jeffrey Gillis-Davis are authors on a paper "Detection of Solar Wind-Produced Water in Irradiated Rims on Silicate Minerals" published online today in the Proceedings of the National Academy of Sciences. Bradley and Ishii were associated previously with Lawrence Livermore National Laboratory prior to joining HIGP in January, 2014. Additional co-authors are James Ciston (National Center for Electron Microscopy), Michael Nielsen (Lawrence Berkeley National Laboratory), Hans Bechtel (Lawrence Berkeley National Laboratory), and Michael Martin (University of California, Berkeley). They report the detection of water in vesicles within (solar wind-produced) space-weathered rims on the surfaces of interplanetary dust particles. The significance of their work is highlighted in this Discovery article, "The Solar Wind is an Interplanetary Water Factory." See the UH Mānoa news release. Also, listen to the interview (.mp3) with John Bradley on Hawaii Public Radio's "The Conversation." HIGP researcher Jeff Taylor joins a discussion of the December 2013 Moon landing of China's Chang'e-3 lander and rover in this LA Times piece, "China's moon mission captivates scientists". Additional information and geologic context of the Chang'e-3 landing site is available in a PSRD report, "Titanium Variations in Mare Basalts at the Chang'e-3 Landing Site on the Moon". Following up on the paleotsunami research reported in December, 2013, HIGP Interim Director, Rhett Butler, appeared on Hawaii News Now this morning to discuss the evidence being collected on Kauai of ~400-year-old sediment deposits attributed, with the help of computer-modeling, to an ancient tsunami surge caused by a huge earthquake near the Aleutian Islands. Watch the interview at Hawaii News Now.